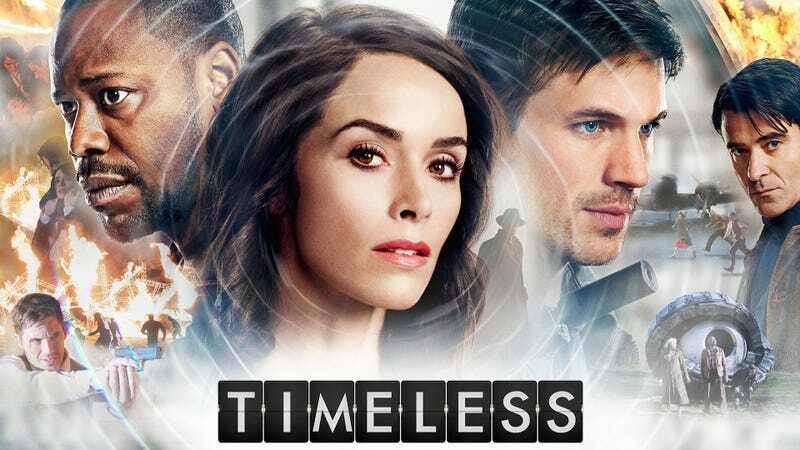 Timeless is a new NBC show from Shawn “The Shield” Ryan and Eric “The good seasons of Supernatural” Kripke that aired last night. How was it? It was...okay-ish. Well. I can honestly say that I was never bored and that’s good. We have Generic White Female Main Character With Smart Background, Generic White Male Main Character With Military Background, and Generic Black Nerd Male Main Character. Oh and Luka from ER is our villain. Maybe. Let’s go back in time and take a look at the pilot for Timeless, shall we? Alright, so perhaps calling them all generic was a bit of an overstatement, but not by much. I could tell as soon as they all appeared what their personalities were like and if they would have a Mysterious Past(TM) and I was never really surprised during the entire episode, except perhaps for the very end. There’s Lucy Preston, played by Abigail Spencer whom I know from the hilarious Bachelor parody called Burning Love. Lucy is a history professor who was denied tenure even though she totally deserves tenure because of her mother or something and so much exposition. I half expected her to say, “As you know, my mother instilled in me a love of history and was thus why I became a history professor” and for the other character to say, “Yes, I know. You’ve told all of this to me before.” In any case, because she knows so much about history, she is recruited when a time machine is stolen from Mason Industries, headed by Connor Mason, played by Paterson Joseph, whom I know from Doctor Who and Jekyll and who is generally awesome. Then there is Wyatt Logan, played by Matt Lanter who is apparently the voice of Anakin Skywalker in The Clone Wars. Which is a weird coincidence, because Wyatt also has a dead wife whom looks similar to a character they meet in the past which is why he wants to save her and zzzzzzzzzzzzz oh sorry I fell asleep he’s so boring. He’s like Grant Ward before the interesting Hydra reveal. And finally there is Rufus Carlin, played by Malcolm Barrett, whom I know as Lem from Better Off Ted (that was such a great show). Rufus was one of the programmers on the Time Machine that Mason Industries made, so he has to go back in time with Lucy and Wyatt in order to stop the evil Garcia Flynn (Goran Visnjic, whom you might know better as Dr. Luka from ER), who stole the fully functional time machine in order to...do things to the timeline or something. It’s not clear. In any case, Rufus is a black nerd who has a crush on one of his coworkers and blah blah he can’t ask her own blah blah and then at the end of the episode he asks her out and blah blah. He operates the “Life Boat,” the original prototype time machine in order to go back in time with Lucy and Wyatt and stop Flynn from doing whatever he’s going to do. The good about this episode: the pacing. It just jumps right into it and never stops. There’s some nice action, some good jokes, and some good character moments. The bad about this episode: it is generic as all hell. The characters might as well be cardboard cut outs. The white guy (Wyatt) is probably worst because we’ve seen this character type over and over again and the actor brings nothing new to the table at all. I love Malcolm Barrett, but he’s kind of wasted in this except for one scene where he chews out a racist cop from the past. Paterson Joseph gets to be mysterious and that’s about it. As for the plot...meh. If you’ve seen time travel shows before, you know what to expect. Twelve Monkeys does it all much better, but I guess since this is on NBC, the executives don’t care. Flynn has a book of stuff to change about the timeline, but that book is written in Lucy’s handwriting, so...she switches sides for some reason in the future? They can’t go back and stop Flynn from just stealing the time machine because no person should exist twice in the same timeline. And Flynn successfully saves the Hindenburg, only to try and blow it up the same night because of all the famous people that will be traveling on it. The Time Traveling Trio stop him, but they can’t stop Plucky Female Reporter Kate Drummond (Shantel VanShanen, Patty Spivot from The Flash) from dying, thus saying something about how something things in time are...meant to happen? I guess? And then Lucy goes home and finds that because the Hindenburg didn’t crash at the same time it was supposed to, her sister was no longer born. Whoops! Favorite part of the episode: Paterson Joseph saying “closed timelike curve,” even if his explanation makes no sense whatsoever.